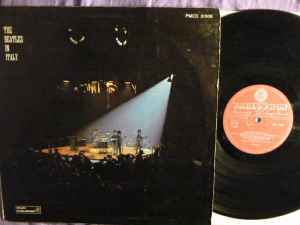 How many Beatles fans across Europe and the UK outside Italy and the Japanese were caught out and shelled out thinking that this was indeed a live concert recording, Only to find its actually studio originals and you have been duped! What the Marconi-EMI Italy team could have done was to mix in applause (for great examples of this "Live" deception in practice check out USA Columbia Inc's " The Andy Williams Show" album or The UK Columbia Grapophone/EMI The Dave Clark Five "Rock N' Roll" Medley 7">>>>>> clearly someone in Milan had serious second thoughts about doing this to George Martin masters, in case they lost their job-o ! " I have no doubt Capitol would have done this and put the clapping out in Duophonic and the tracks in mono! This LP was released straight after The Beatles concert in Italy 1965 to cash in,as such!It was originally released with the red Parlophon label but the colour changed to black and silver after only 1 month-hence the rarity of the red label issue.The change was due to a general change by the Record Company as far as I can ascertain. This is infact the 2nd issue.The first issue had red labels and came out in 1965 also. what makes this even worse was that it was only ever cut/mastered in mono. as a curio it is just that anything else it's "di crappo di wappo"